Written and verbal language are vital to the development of communication skills. Unfortunately, disorders of these traits—specifically reading disability (RD) and language impairment (LI)—are common, leaving affected individuals at risk for adverse academic, socioeconomic, and psychiatric outcomes. RD and LI are complex traits that frequently co-occur, leading to the hypothesis that these disorders share genetic contributors. In this webcast, John Eicher of the Yale Child Health Research Center will discuss his search for shared genetic contributors by performing two association scans: (1) Characterizing the contribution of the DYX2 risk locus to RD, LI, and IQ; and (2) A genome wide association study (GWAS) on individuals with comorbid RD and LI. Eicher found four DYX2 genes, including known risk genes DCDC2 and KIAA0319, and new candidates FAM65B and CMAHP, were associated with RD, LI, and/or IQ. 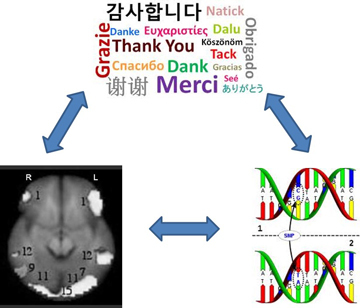 There was a non-additive interaction between two risk variants in DCDC2 and KIAA0319 on reading and language traits. The GWAS of comorbid RD and LI, produced associations with markers in ZNF385D and COL4A2. Markers within NDST4 showed associations with LI. Eicher replicated the association of ZNF385D in the Pediatric Imaging Neurocognitive Genetics (PING) study. Using diffusion tensor imaging on PING subjects, ZNF385D markers were predictors of overall fiber tract volumes and global brain volume. The contribution of DYX2 risk genes, DCDC2 and KIAA0319, and present evidence for FAM65B and CMAHP as new candidate genes are confirmed. Additionally, a new candidate gene for comorbid RD and LI, ZNF385D is implicated. Further study of ZNF385D, a hypothesized transcription factor, should identify target genes of ZNF385D and its neural implications. John Eicher is a Ph.D. candidate at Yale University. John's thesis involved conducting GWAS research that seeks to determine if an association exists between reading disability and language impairment in humans. John was one of the first place winners in Golden Helix's first annual abstract competition.